One of the best things about the internet for me is running into baseball fans who share the same fond memories as I do of relatively obscure Tigers from the 1970s and 1980s. Over the past dozen years, I have learned that I am not the only Tigers fan who still counts John J. Summers Jr. (better known as Champ Summers) among his all-times favorites. So, when Mr. Summers died at the age of 66 in October, I wanted to write something to honor his memory. I felt he deserved more than a footnote during a playoff run though, so I waited until now. You may have guessed from his nickname that Summers was a first-round pick destined for greatness by the age of 15, but that could not be further from the truth. Besides having the greatest baseball name ever, Summers is a good story because of his atypical career path. He never played a minor league game until the age of 25 and first reached the majors a month short of his 28th birthday in 1974. 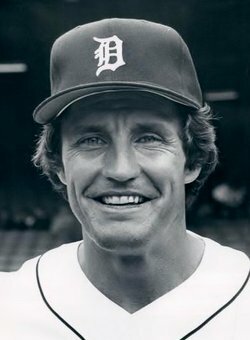 He had little success in the majors from 1974-1978, but finally broke through at age 32 in 1979 with the Tigers and gave them a couple of excellent years. Then, like a dream, Summers disappeared as quickly as he emerged. The left-handed hitting outfielder was born on June 15, 1946 in Bremerton, Washington. His family later moved to Madison, Illinois where he attended high school. It was a very sports-oriented family with his father a prize fighter in the United States Navy and his mother a pro bowler. Not surprisingly, Champ became a fine multi-sport athlete himself. In fact, he beat a younger Jimmy Conners in a tennis match in high school. So, where did Summers get his nickname? When he was born, his father declared: "He looks like he's just gone 10 rounds with Joe Louis". Thus, the nickname "Champ", although he usually went by the name "John" in his youth. Upon graduation from high school, Summers entered Nicholls College in Thibodaux, Louisiana where he played basketball for two years. He was then drafted into the United States Army where he became a paratrooper. He served for two years and fought during the infamous Tet offensive. His time in Vietnam would, of course, be the most heroic two years of his life, but where would he go from there? He was 23 by the time he completed his service and surely did not seem destined to be a professional baseball player at that point. In 1969, Summers entered Southern Illinois University at Edwardsville where he played two more years of basketball. He averaged 18.8 points per game and drew rave reviews from his coach Gary "Bo" Collins many years later: "I'd go out on a limb and say Champ might have been the best athlete that ever played at SIUE". What about baseball though? Summers did not try out for the SIUE baseball team until 1971 and according to Collins, showed up in grand style: "Champ came riding down to the field on a Harley without a shirt on, had his hat on backwards and Roy (baseball coach Roy Lee) watched him pull onto the field." Coach Lee was skeptical, but he quickly changed his mind when he saw him field and throw and tear the cover off the ball. Summers went on to bat .340 with a team-leading seven home runs in his lone season. His performance at SIUE attracted the attention of the Oakland Athletics, but Summers would not be chosen in the amateur draft. He was instead signed as an un-drafted free agent receiving less than $500 after veteran scout George Bradley saw him playing in a softball game. Summers' first minor league season was with the Coos Bay - North Bend Athletics of the short season Northwest League. He batted just .252 with three home runs in 252 plate appearances which is not too impressive for a 25-year old outfielder in low A ball. In 1972, the Athletics moved him up to the Burlington Bees of the Midwest League where he improved significantly batting .308 with a .383 on-base percentage and 30 extra base hits in 311 PA. It should be noted that he was one of the oldest players at that level though. Summers then batted .333, but hit only eight homers in 319 PA for Tucson of the hitter-friendly Pacific Coast League in 1973. After starting another season at Tucson, he finally made his debut in the majors with Oakland in 1974. Summers replaced the legendary Reggie Jackson as right fielder and clean-up hitter in the ninth inning of a game versus the Indians and proceeded to line into a double play versus Gaylord Perry in his only at bat. One time when he was signing autographs before a game at Oakland during his rookie season, Summers signed "John J. Summers" on each item handed to him. Seeing what was happening, Jackson asked whether he had a nickname and Summers responded that he was sometimes called "Champ". The flamboyant Jackson told him he needed to use that name all the time. So, he was no longer John J. after that. Summers spent time in the majors each year from 1974 to early May,1979 playing for the Athletics, Cubs and Reds batting a paltry .204/.294/.318 in 412 at bats. He did however show significant power for the first time batting a sizzling .368/.465/.665 with 34 home runs for Triple-A Indianapolis of the American Association in 1978. He also became a favorite of Reds manager Manager Sparky Anderson which was always a good thing. After a slow start in 1979, Summers was traded by the Reds to the Tigers on May 25 for a player to be named later which would eventually be southpaw Sheldon Burnside (who pitched 4 2/3 innings after leaving the Tigers). Tigers manager Les Moss put Summers in the line-up as a platoon right fielder. He had mixed results at first, but seemed to hit his stride when Anderson took over as manager in mid-June posting a .934 OPS for the month..
As a Tigers fan living in Massachusetts, I will never forget the three-game series versus the Red Sox from June 26-28. There were not a lot of opportunities for me to watch the Tigers on television in those days, so a series versus the Red Sox was always special. Summers came through with seven hits including a home run in each game. He had hit only four home runs for the season prior to that series, but from that point on I was a big Champ Summers fan. The 33-year-old journeyman gained a lot of fans that summer as he tore up the circuit with OPS of 1.106, 1.053 and .976 in July, August and September respectively. For the season, he batted .313/.414/.614 with 20 home runs in 290 PA for the Tigers. Summers' 1.038 OPS was surpassed by only two AL regulars - outfielder/designated hitter Oscar Gamble who hit 1.065 for the Rangers and Yankees and Red Sox slugger Fred Lynn (1.059). Of course, the best thing about his season was that it was so unexpected. Summers would not be a one-year wonder silencing any doubters with a robust .291/.401/.556 again as a platoon man in 1980. Some fans wondered why he did not get a chance to play every day, but Sparky liked to platoon and the Tigers had the perfect partner in John Wockenfuss. The multi-positional Wockenfuss pounded lefties to the tune of a .987 OPS in 1979 and .915 in 1980. I recall Summers expressing a desire in 1981 to face more left-handers and Sparky gave him a chance against two good ones on May 22-23 versus Baltimore. The experiment did not end well as Summers went hitless versus southpaws Scott McGregor and Mike Flanagan. Summers did not hit for as much power in 1981 even versus right handers, but was still batting a solid .287/.389/.415 through June 11 when the player's strike brought the season to an agonizing halt. When Summers returned after the strike in August, he was not the same player and hit .211 down the stretch. He was traded to the Giants for infielder Enos Cabell in March of 1982 and never did much after leaving the Tigers hitting .219 with little power from 1982-1984. He was best known in those years for his role as a Padre in a series of bench of benching clearing brawls in a game at Atlanta on August 12, 1984. If you like baseball brawls, you'll love this video. Everybody got involved including the fans. Summers would return to Detroit one last time to face Anderson and the Tigers in the 1984 World Series. He struck out in his only at bat which would also be the last of his career. After retiring as a player, Summers worked as a hitting coach for the Yankees under Bucky Dent in 1989-1990. Later, he managed the Gateway Grizzlies of the independent Frontier League. Summers' light did not shine long, but it burned bright in Detroit in the magical seasons of 1979 and 1980. Tigers fans over forty will never forget the man with the perfect baseball name. Champ as in Champion. Summers as in the summer game.